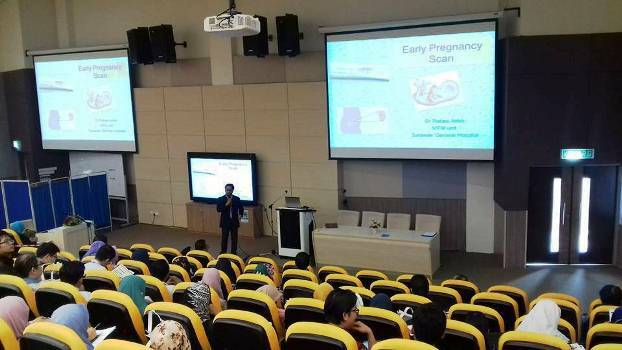 FRIDAY, 23 SEPTEMBER – The Faculty of Medicine and Health Sciences (FPSK), Universiti Malaysia Sabah (UMS) organised a workshop on ‘4th Ultrasound in Obstetric and Gynaecology’ for three days, held at the Main Auditorium of the faculty. The workshop was jointly organised by the Women and Children’s Hospital Sabah and IDS Medical Systems Group (IDSMED). The opening ceremony was officiated by the Deputy Dean (Clinical Research) FPSK, Associate Professor Dr. Helen Benedict Lasimbang representing the Dean of FPSK, Prof. Dr. Zainal Arifin Mustapha. In her speech, Dr. Helen said, the understanding and use of ultrasound was important in the care and management of obstetric patients nowadays. “Ultrasound is routinely used to protect pregnancies as part of antenatal care in order to ensure that the foetus is developing normally besides able to detect any problems that might occur during the gestation period,” she said. In this connection, as doctors and medical practitioners, it is important to understand the principles of ultrasound, which includes awareness on the handling and application.